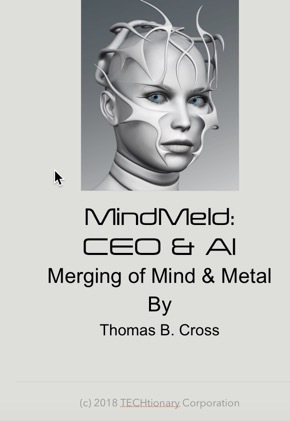 The following is the introduction to MindMeld: CEO & AI Merging of Mental & Metal book now available on iBooks. For more information, speaking, press, interviews, strategy and product planning guidance, email cross@gocross.com. In the beginning of any project there is a spark of inspiration that leads one to pursue the unknown. For the past five years, considerable research has taken place in the field of human-made machines that act or perform functions like humans. The goal of this book was to do the following: Address the underlying problem that management and people are at the center of all concerns in the use and abuse of technology; Recognize that communication and understanding are the limiting factors in the development of artificial or machine-based technologies; Understand that technology has a social function as well as an analytical function; Cope with the limitation that present technology is hardly more advanced than the Model T was in its time period and the technologies that will emerge even only 10 years from now will be as dramatically different as the jet airplane is from a candle.